Its the beginning of August so it's time for me to introduce our new artist of the Month! Thank you Jean Haines for agreeing to be our Featured Artist this month. 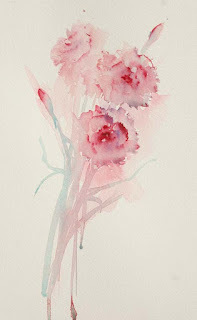 I love the spontaneity and freshness of your Watercolours. Thank you so much for inviting me to be the featured artist of the month. An invitation which I believe is a wonderful compliment and honour. I never take for granted how lucky we are to be able to share with friends and fellow artists from all over the world with the technology now available to us. We can be inspired and hear of art that once we may otherwise never knew existed. As a child I remember watching a young teacher giving a talk to our class. I was in awe of her energy, thirst for life and enthusiastic way of sharing her knowledge. She held a painting of a small blue flower for all to see. That single moment in time led me to my earlier career as a botanical artist. But I have never forgotten the young woman who enthralled the class with such simple beauty on paper. I was fortunate to have incredible art teachers throughout my education who saw in me what I did not. Only years later do I now fully understand what they were trying to tell me. They thought I was born to be an artist. All I know is, that as an adult I wish I hadn't waited so long to believe in their faith in me! I met, fell in love with and married a wonderful man whose career took us all over the world. Whilst constantly moving I never tired of learning from masters I met in so many countries. In Asia I studied brushwork from an established artist from Shanghai. Her words of wisdom have remained with me and I pass on her wonderful tips in my own workshops. I absorbed the vibrancy of colour from my time in Dubai. Here I met amazing artists from India and Pakistan who gave me so much in the way of influences for portraying subjects that are full of life and character. This was my time to study portraiture and I did eagerly. Taking in every single tip and piece of advise. Pinks, a floral study coming to life using placement of the subject in a simple composition. I write features for a variety of magazines. Each time I aim to add something new as my exploration into technique leads me to meeting manufacturers who have vast ranges of new shades available. Years ago I would have worked totally with one brand of product. Now I am very aware of the need to keep up to date with what is "out there" on a regular basis. Life as an artist has never been so rich because via the internet we know what other artists are using and we can share our discoveries so easily. Colour is so important to my life and art so I always look for something that is exciting and new to keep my watercolour fresh and alive. The cockerel from the cover of my new book and a favourite painting because of the vibrant orange combining with red in the main section of my subject. I won an award for a body of cockerels during an exhibition and they seem to now follow me everywhere! I do believe that listening is a vital key to being an artist. Not just to experienced artists who may encourage us in our journeys but to our chosen subjects as well. Often I find mine lead my brushstrokes almost guiding me to where I will lay colour next. I work minus a preliminary sketch as I allow colour alone to build my compositions which are often impressions of what I see. I aim to tell a story in each new painting, leaving sections for the viewer to fill in using their own imaginations. This communal bond between us tends to add to the magic within each piece. And I don't use the word magic lightly. I often watch as subjects appear half way through a painting session and feel mesmerised by how they have come alive simply with colour and brushwork. I have painted for so long now and yet I still feel a sense of awe when pigments interact creating incredible patterns. I exhibit in a number of established galleries and hold solo shows during each year. Right now I am looking forward to 2013 as I have some very exciting events already booked which will ensure my brushes move continually on fabulous new subjects that have not yet been unveiled. 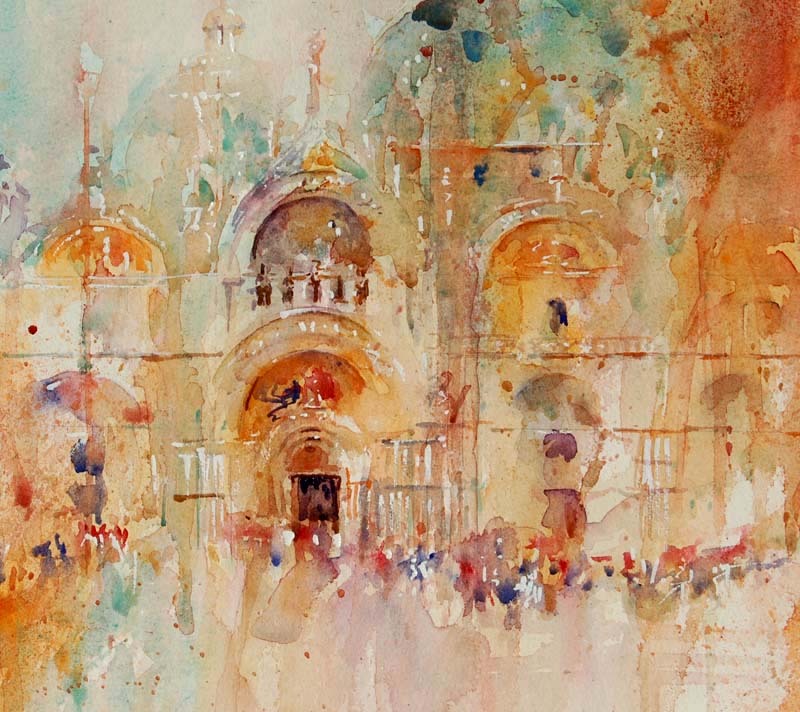 I hold international watercolour workshops in Hampshire, UK. and I love that artists are attending them from all over the world including Vietnam, Iceland, Canada. France, Italy and South Africa. I look forward to each season and meeting new artists on every session. I feel so blessed to continually keep meeting wonderful people who often stay in touch long after the sessions are over. In Autumn 2012, I will be holding workshops in Texas and New York which truly is very exciting and I can't wait! Passionate about working in this medium, my enthusiasm led me to writing. 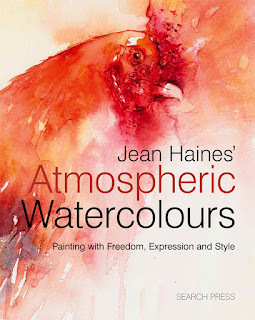 Taken on as an author, my publisher launched my second book "Atmospheric Watercolours" earlier this year in may 2012. To hear it is selling well in so many countries, in all honesty, has taken me by surprise and overwhelmed me a little because all I have ever wanted to do is share my love for working in watercolour. And encourage others to enjoy painting in this medium as much as I do. I wanted to give all I knew to others so that if the day ever comes when I cannot paint, everything I have enjoyed will be there in a book . I have simply shared my love of working in my chosen medium in a way that I hope others will follow to either learn how to paint, gain motivation and enthusiasm and also reach their own dreams. If anyone had asked me what my dreams were years ago I would have said " I want to be an artist ". I still do and I cherish each day I am able to move my brush because capturing a subject on paper is the most thrilling of all feelings in life. I want others around me to know this pleasure and joy and most of all, I want everyone who has a dream related to art to see that vision become a reality. I dreamt of writing a book, being in galleries and exhibiting. I wanted to write art features. I never dreamt of having my own brush range but I do with "Rosemary&Co" and I love them. I still have dreams for the future. Maybe if I come back in a few years time I can say what they were and if they came true also! I believe if you want something badly enough, it will come to you. But at times to achieve dreams we need to work hard, practise and most of all believe in our own abilities. There will always be someone willing to knock you down or criticise your work. If you enjoy painting nothing else should matter as much as that heady thrill when you create. Be true to yourself, love what you do, find inspiration and grow continually. No matter at what level you are in your art journey. I see all artists as if they are on different steps of a ladder. Some at the top on the highest rung in their careers. Others are just starting out making their first steps. However we are all in this art world together making our way, learning from experience with our own ups and downs. And most importantly we were all beginners once, even the greatest of masters had to start somewhere and I don't think many of them had a very easy climb! The cover from my first book " How to Paint Colour and Light in Watercolour"
For me, I see beauty around me constantly. I am always on the happiest of highs and I love life. I have so many fabulous friends who I care about so very much and a terrific family. Without anything else in it, my life is rich but if I can just have paper, watercolour pigments and my brushes as well for the rest of my life along with the gift of sight I will be very blessed! Jean,thank you for sharing your stunningly beautiful work with us.Your enthusisum and joy are inspirational.Your images come to life just jumping off the page. I look forward to learning so much from you! Thank you Jean. When an artist is willing to share their knowledge and love for what we do it opens up whole new worlds and fresh ways of seeing for so many people. Artists are never depleted by sharing, only enriched as others give back. We can not copy others work only expand on their techniques. I have been a fan of yours for some time and enjoy your web site and blog. I see you are holding a workshop in New York - when I saw that, I hoped perhaps it was in somewhere close, such as Buffalo so that I could sign up. Long Island is a little difficult even though I could stay with my daughter in Manhattan. Have you ever held workshops in Ontario - specifically the Toronto area and is this something that may happen in the future? Hi again Shirley, I love your reply and I do totally agree. I learned from artists long before I could use the computer,in countries I once never imagined living in. I have also seen the poorest of artists creating with so little in the way of materials and yet they have produced amazing work. We are so privileged in so many ways without realising it.And I am thrilled to be meeting you and new friends here too,again another reason to count myself lucky! Hello Tony, thank you so much for liking my work and following my blog. I must confess I often type posts and never consider they will really be read by anyone other than me. I type directly from my heart and often go back and read what I have typed thinking how open I have been,maybe too open! But I love getting emails from complete strangers letting me know they like my posts. A few artists have told me they dread me going away on holdiay or holding workshops as they know my blog will fall quiet and they are absolutely right,it does! My workshops in USA this October are all fully booked and have been for some time, I am really looking forward to my visit. But I am now looking at locations for 2013 and anything is possible! I have never been to Ontario and would love to come there. Right now I have been invited to two USA locations for next year but until I have meetings later this year I won't confirm my diary as so much is happening with some very exciting projects. If anyone would like to invite me to hold a workshop for their Art Society or group now really is the time to get in touch! Tony thank you so much for leaving a reply and a question too,its terrific to be able to meet up and communicate here, maybe we can in person one day. Tony and Jean, I have let Tamar at Studio Six. Markham, know of your interest. We will have to wait and see. Hello Ona and Tony, it is amazing how one action can often lead to another lending fate a helping hand! I had no idea when I accepted this invitation that a visit to Canada could be a possible outcome. I will be in touch with Tamar and let you know, this could mean actually talking not typing to each other at some point if diaries and other aspects allow.Thank you so much Tamar and Tony! Beautiful work Jean and what an inspiring post to read. Enjoyed it. Hello Jean. I love your work.Do you have a favorite subject to paint? Thank you so much for such a wonderful and kind comment. I love your work too! Its' lovely to see you and thank you so much for your question regarding my favourite subjects. I must admit I had to think about my answer at first because if you had asked me this years ago without hesitation I would have said Portraits. I realise now how much I have changed over the years as an artist because now I have so many! Maybe where we are living affects what we love to paint more than we really fully know. When I lived in Dubai I would see the most incredible faces every day and I couldn't resist painting them. They became favourite selling subjects with galleries but on that note so did my paintings of camels. I have to admit to this day I feel as though I am "cameled out" because I honestly did paint so many! I have always adored painting flowers so they will always be a huge part of my life and everyone who knows me well will understand my passion for capturing dogs in watercolour too. A while ago I fell in love with an amazing cockerel and just had to paint it. I had seen the magnificent bird in brilliant, morning sunlight and the colours on its back especailly were glowing. I visited several times and painted him in many poses. He had such a regal posture at times but then at others he looked as though he was in a bad temper! I couldn't stop painting him as he had touched a button inside my creative soui. I had to satisfy that inner yearning to better each piece I created. I just couldn't stop painting cockerels at all which led me to winning the Anthony J Lester Art Critic Award in 2009 for a body of work,four glowing cockerels and maybe my love for them shone in that collection. So they became a firm love of mine as a subject for some time and galleries loved them. I paint what I love,when I want to rather than be dictated to by what sells and what I am asked for. Which isn't helpful from a commercial angle but I need to paint from my heart as that is who I am as an artist. But right now I have changed again in subject matter. Especially since writing my latest book which has led me to exploration in ways that I didn't expect or see coming in as mind blowing techniques as I am using now. I feel excited like the new beginner who gets it right fo rthe first time as if I have only just picked up my brushes fo rthe first time in my life. And I am reading wonderful emails from readers of my new book who are telling me I have changed their lives which is so exciting. But I have changed mine too! All through colour and love of a medium! There is something very strange in trying to inspire others when you write an art book.You become totally absorbed in looking for new ways to paint famililar subjects. With me I cannot paint the same thing twice and I don't even want to always gain the same results. I always want to paint each new piece in a way that is far better,more exciting and more fascinating. Whilst writing "Atmospheric Watercolours" I seem to have turned on my own "artistic buttons" as I can't stop painting just about everything now! I would say I am in love with colour and movement more than the subject itself as my horse racing paintings probably highlight best of all. So Nicole, do I have a favourite subject? Maybe I do. Because every single day I see something new as a challenge and temptation for my brushes and nothing is impossible to capture in my technique. I have just watched the 2012 Olympics and feel that familar tug at my artists soul. I want to paint the atheletes so my studio is calling. This could be this weeks favourite subject! Goodness that was a long reply but I do hope it is helpful. Thank you so much for your question! Hi Jean! Love your art style, I've often thought about trying that sort of thing, but could never figure out what colours to use or combine for the washes (before making it into something). Which colours do you like to use? 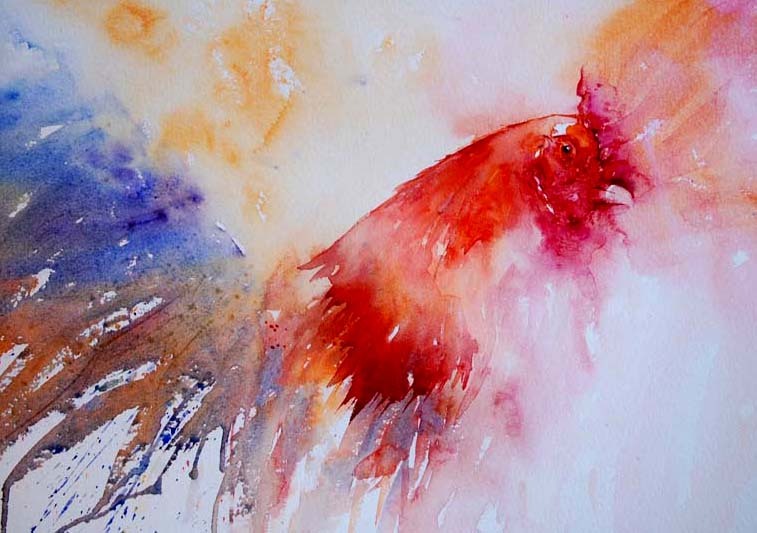 Do you put multiple colours on wet on wet or let each dry before the next colour? Wow that is a brilliant question too! I love reading these questions as they are making me really think about what I do and why, so thank you so much! Firstly I always work on dry paper so that I don't dilute the shades I am using. I work mainly in transparent colours and these would always be used in my first washes. I find transparents allow me to layer and build up colour in the sections I need to, far better than opaques that can often look dull under glass when framed. Opaques are brilliant for adding body in block colour for the final stages of my work. I work with two main techniques which I describe really in detail in my latest book. 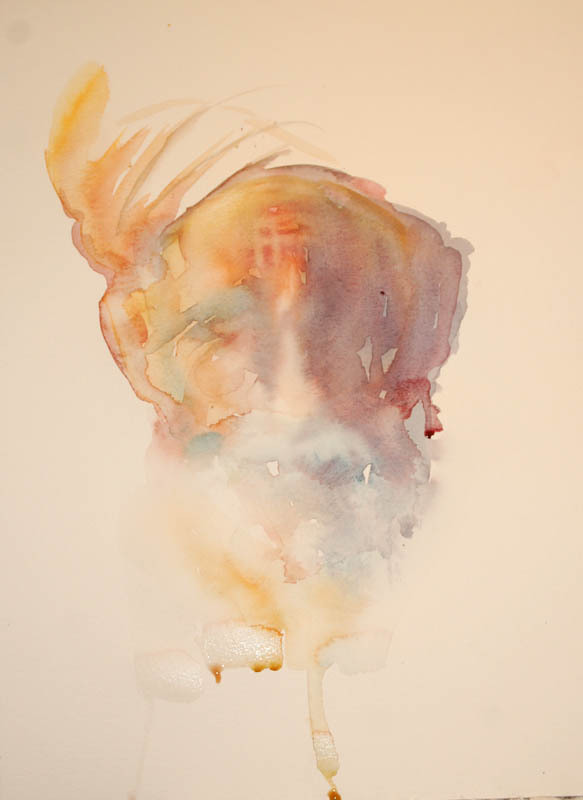 One is working from a starting point which is using pigment to immediately create the subject. But while I work in my other favourite technique with washes, to find my subject within them I use a combination of colours that really scream to me what the subject is. I allow them to interact while drying without touching them at all, as I believe if we fiddle we kill the spontaneity of the fabulous patterns created when watercolour as a medium is left to work on its own. Once dry, I then layer on top of the initial wash. So multiple colours in a first wash merging naturally until they dry.Then working in layers on top. My favourite colours are Orange,I love Scmincke Transparent Orange and all the purples you can find.The more vibrant the better and I think I might be lost without my cobalt turquoise now! I know several artists who find it very emotionally heart wrenching when a painting sells... it feels like a part of them is leaving. I get very emotionally involved/ caught up in a painting while I'm painting it but once its finished there are very few paintings that it would be a huge wrench to part with. ...Its more the process of creating that I am so strongly attached too. Once its finished its like that 'story' is now told and its ready for whoever can relate. While I'm painting it though its very hard to 'leave it' and say, go on holiday or paint something else. I just wondered how you feel about your art while painting and if there have ever been paintings you could not part with or you found it hard to sell? thank you for being our artist this month. I have really enjoyed reading and looking at your work. That is a wonderful question and I think my answer will have changed over the years! I wonder if all the world over we,as artists, go through the same or at least similar emotions regarding our work. There are those formative years when we simply want someone,anyone, to like our art and buy it. But those first paintings are an important part of our art journey and are maybe the hardest to let go of. My first serious sale was of a mosque while living in Dubai. I loved capturing the colour and memory of that time in my life so felt completely connected to, not just a piece of paper but, a part of that story in my life. It sold straight away and the gallery were delighted as it was only on the wall for a very brief time.I remember feeling so happy that the gallery were delighted but at the same time I had mixed feelings because I had wanted the landscape to hang on the gallery wall a little longer than just one day to see if anyone else liked my work. I wanted to be seen as a good artist, worthy of being in the gallery amongst other leading artists. Strangely,I hadn't wanted anyone to buy my "masterpiece" so quickly! I had a touch of disappointment which sounds really silly! At another earlier solo exhibition I can remember asking for red dots to be placed on two special pieces that I didn't want to part with. I had a dog looking at a ball in one composition and two children sat on a beach in another. Neither painting could I part with and so I asked the gallery manager to place red dots on them before the show opened. But I was wisely talked out of doing so. At the private preview a couple bought each painting without their partners knowledge, as a valentines gift for each other. I was told the wife had cancer. Years later I heard that this brave lady had looked at my painting on her bedroom wall until the last day in her life and it brought her so much peace and happiness. How could my keeping this painting have been more important? It couldn't have been. I learned a valuable lesson about letting go at this time in my career. We never always know how our art will be enjoyed by those who buy it but I have had some incredible stories that have touched my heart in so many ways. Like the couple who bought another of my children on a beach scenes and I later heard they had lost a son. My painting reminded them of their child and they thanked me for it. And the elderly lady who now cannot have a dog finds comfort in talking to one of my dog watercolours each day. An original painting that hangs in her home and she loves it,a treat to herself to keep her company. I doubt I will ever paint another dogs eye with so much life in it that this particular painting holds and I would have loved to have kept it but what pleasure it gives me to know how happy that lady is with it. I do have special pieces that stay in my mind. I look back and remember the day I painted them. But many I now let go of and part with because it is the creative journey that really is,like you, the most emotional attachment and I cannot frame that part of the process. My art is evolving continually and I love the excitement of picking up my brushes. I thrive on that inner feeling of the "wow" factor when colours work especially well. When I see a subject first come to life I usually hold my breath and feel as though I have reached the highest of highs. I part with paintings now far more often and I am getting used to saying goodbye to favourite pieces. But there will always be one or two in each show that you just know you don't want anyone to buy. And they are always the first to sell! Maybe that is a good thing! 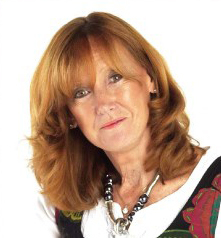 Thank you so much Vicky, its such a wonderful honour and pleasure to be here and I am loving answering the questions asked of me because as in Onas' case they are bringing back such wonderful memories. I am with other questions really thinking about how I work and why which is rewarding for me to learn more about too! talking of selling paintings, how do you go about pricing them. do you price on the size of the painting, the hours taken painting it or is there something else you use. I never know what to price them at. That really IS a very good question! I rarely price my own work now as this is a joint decision between myself and the galleries who represent me. They have experience which as an artist I am guided by. But it is always wise to take the framing costs and if appropriate, commission from a sale through a gallery into account when selling. It is really difficult to base the sale price of a painting on size alone as some smaller paintings take as long to work on or are more detailed than larger pieces. Also a painting may have taken a shorter time to create but that could be based on the artists skill and the years gone into learning their craft. This is such a diverse topic of conversation and I am sure many artists replies would vary. If an artist is just starting out at selling its' always a really hard part of the process to learn. Too high a price and you may lose a sale but too low and you may be giving your work away for too little. Joining art societies or visiting exhibitions can be really helpful by observing how much other artists sell their work for in similar styles. This can really be useful and help as a guideline. In all things and areas as artists we learn from others. Selling and pricing is as much part of the process as is the actual learning to paint in itself. I've just got back from holiday in England. What wonderful art! I susally enjoy a more realistic style but there is something so spontaneous about your work. Thank you for telling us a little about you and your motivations to paint. Thank you so much Abby.The weather in England hasn't been too wonderful this year so I hope there was some sunshine when you were here. I started as a botanical artist painting every single detail and it was quite some time before I really moved to my style which has evolved over the years. 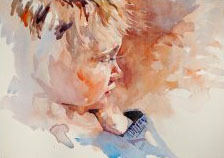 I do love realism and fall in love with so many paintings where I can admire sections that tempt and fascinate the eye. The kind of painting you always see something new in each time you look at it. I enjoy abstract if it has been well executed. I find I want a mixture of both in my work with areas that are defined against areas that are definitely not so I guess I gain the best of all worlds in my creations as I can wander into detail,out of it and into abstract all in one composition! It is great fun. Thank you so much for the very kind invitation to be August 2012 Artist of the Month on The Waterfront. I owe a huge thank you to everyone who has asked such fantastic questions, many of which I have really had to think about before jumping in and replying. Over time I believe we often become so used to working in a certain way that we miss really thinking about why we paint,show or share in the way we do. To take time out and really think about some of these thought provoking questions ha been very healthy for me and I have loved sharing my answers and thoughts with you all. Ona you are a very thoughtful and generous personlaity yet alone an incredible artist,thank you for thinking of me and for sending the invitation.